In T20 cricket every team want to have a player who can be the X-factor and win games for them by taking on the oppositions. In the history of Indian Premier League, many players have emerged and established themselves as the captain's go-to-weapon by proving themselves in crucial situations. Even in the 2019 edition, players like Rishabh Pant, Kagiso Rabada, Andre Russell etc. have stolen the limelight with their phenomenal performances to be the most crucial weapons for their teams. Kolkata Knight Riders are fortunate to have some quality players who have served the purpose and one of the top ranked name is Andre Russell. His explosive batting and the ability to send the ball into the stands with his muscle power makes him a lethal weapon for his team. In IPL Russell has scored with a massive strike rate of 185.49 making him one of the most dangerous batsmen. Russell too, hasn't disappointed his team either. He is the top scorer for KKR this season scoring 312 runs from 8 matches with a whopping average of 78.00 and a strike rate of 213.69 helping KKR to win matches, the most notable ones against RCB and SRH where he launched his assault on the death bowlers to clinch victory from the jaws of defeat. 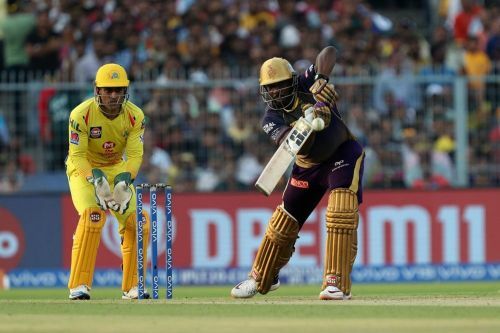 However, after looking at the performances of other batsmen of KKR, the question arises,'Are KKR becoming too much dependent on Andre Russell?' The answer seems to be 'Yes'. Russell's explosive batting has been overshadowing the failures of other batsmen. Apart from Russell, no other batsmen have been performing consistently to produce match-winning knocks, except on a few occasions. It is good to see Russell continuing his dominant batting and winning matches for KKR single-handedly and this is a great assurance for KKR that someone is there down the batting order who can score quick and accelerate the scoring rate at the death overs. But the inconsistency of other batsmen may increase the pressure to perform on Andre Russell and this may have an impact on Russell's as well as KKR's performance. No doubt, the other batsmen of KKR like Chris Lynn, Robin Uthappa, Nitish Rana, Dinesh Karthik etc. are able ones and have performed to prove their worth. But their inconsistent performances and the tendency throw away their wickets after getting starts have increased the burden on Russell's shoulder to take the team to a competitive total or to win the game. Till Russell is performing, it will not be a matter of that much concern for KKR but if he gets ruled out due to injury or fails to deliver, especially in a do or die match, KKR may find themselves in deep trouble if the other batsmen continue to be inconsistent and do not take the responsibility and play their designated roles. And that's exactly has happened in the recently concluded match against CSK where Andre Russell departed early while trying to add some quick runs and the other batsmen failed to step up and accelerate the scoreboard, eventually losing the game to taste their third consecutive defeat. Although Russell is a relaxed and fearless player which can be seen in his play, but too much expectations from him may have a psychological effect on his game. KKR batsmen must perform consistently to take the pressure off Andre Russell and allow him to play his natural game. Even if he fails, the other batsmen must ensure that they share the responsibility and bat deep to take their team home.